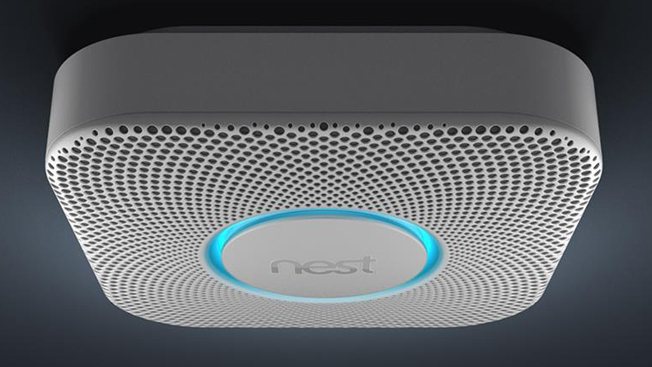 Nest, the brand that reinvented the clunky old thermostat into something swank and intuitive, has just announced its new creation: a smoke detector that isn't super annoying. In a promotional video for the Nest Protect, now available for pre-order, we see that the device actually announces when there's danger and how panicked you should be. "Heads up, there's smoke in the bedroom," the device says when a small candle is left burning unattended. In situations where smoke really starts billowing, the device blinks red, emits a warning tone and says, "Emergency, there's smoke in the living room." Like the Nest thermostat, the Protect is WiFi enabled and communicates with your smartphone or tablet while you're away. There's also a motion-activated light to help you get around at night. And if the device is concerned about something minor, like a slightly burnt casserole, you can "hush it" with a wave of your hand. Of course, there will once again be the issue of sticker shock. Just as the $249 retail price has made many homeowners reluctant to level up their thermostats, the new Nest Protect might be a tough sell for some at $129. Either way, it's good to see that Nest CEO Tony Fadell, the "father of the iPod," still has his sights set on giving more humdrum appliances an Apple-inspired upgrade.